This stunning vintage emerald ring has been crafted in 18ct yellow gold with an 18ct white gold setting. The pierced decorated setting displays an elevated, four swallow tip claw set, feature oval mixed cut 2.90 ct natural emerald encircled with twelve transitional modern brilliant round cut diamonds totalling 2.38cts. This fine vintage emerald ring has elevated, pierced decorated shoulders which integrate into the claw setting and blend seamlessly with the plain 18 carat yellow gold hallmarked shank. The exterior of the shank is hallmarked with the French eagle's head and maker's mark. This 1960's emerald ring is supplied with an independent diamond grading report card. This vintage emerald ring is fine quality, set with a stunning natural emerald and high colour graded diamonds. The French hallmarks show some signs of wear in keeping with the age of the piece. Reflections in photographs may detract from the true representation of this fine example of vintage jewellery /estate jewelry. 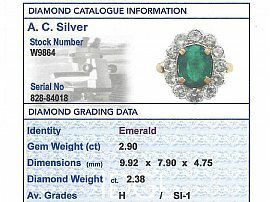 The images do not reflect the true colour of the emerald. The video however provides a more accurate reproduction of the actual colour. Length of cluster 1.87cm / 0.73"
Width across cluster 1.62cm / 0.63"
Height of setting 7.4mm / 0.29"